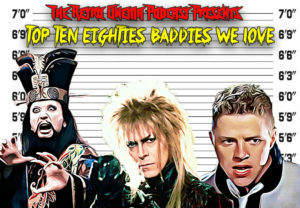 056 – Top Ten Baddies You Love | All Eighties Movies. All The Time! ← Coming up – Top Ten Baddies you love! Such a fun pod cast and so many great choices Gidgt and Angry. I was torn for No 1 and 2 positions too! Hope you had fun in Hawaii Gidgit! I go there a lot. This podcast was fun. So funny about Johnny from Karate Kid. Oops! Some great choices. I was born in 1973 so 80’s are iconic to me!